Is not the classic slide navigation drawer. 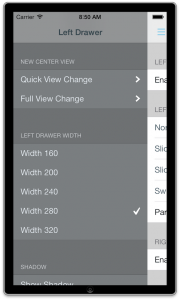 Is A very stylish slide navigation drawer that fits exactly to the iOS 7 design concepts. is a side drawer navigation container view controller designed to support the growing number of applications that leverage the side drawer paradigm. 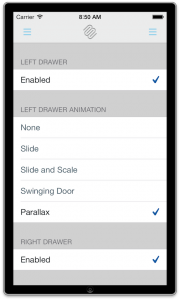 This library is designed to exclusively support side drawer navigation in a light-weight, focused approach while exposing the ability to provide custom animations for presenting and dismissing the drawer. Does not support container view controllers other than UINavigationController (such as UITabBarController orUISplitViewController) as the center view controller. Does not Support presenting the drawer above the center view controller (like the Google+ app). This is just a small selection of side menu solutions out there and which one is the best definitely depends on the use case. What is your favorite?